When you live in Honolulu it's rare that you actually go into Waikiki, land of tourists, hotels, and ABC stores. Chances are that when you have friends or relatives in town - you'll end up at Duke's! In 2007 I drank my very first mai tai at Duke's "Barefoot Bar!" This was just after enjoying my first sunset booze cruise and first pineapple mimosa - now my favorite and the beverage that Bryce stashed in his backpack on the day he proposed to me! Everybody likes Duke's! Aunt Linda and Uncle Wayne celebrated their wedding anniversary there while visiting a few years ago. See the photos of Duke on the wall? It's too bad there's no photo of their flower girl, she was is ADORABLE! Friends from college visiting means a stop at Duke's for tropical beach drinks! Although I'm not sure what Nate's yellow concoction is, I have a lava flow, and Richard's enjoying a mai tai. He later upgraded to the tropical itch - complete with a back scratcher! Just last week my cousin Karen, her husband Terry, and his brother and sister-in-law, were in town. Guess where they wanted to go to dinner? Duke's! We made a reservation and arrived at 8:30 pm and there was still a line to get a table! Luckily we got a great spot next the pool and near the beach. Although the food tends to stay pretty safe and typical (by mainland standards), the brews are local. Bryce was excited to try local Kona Brewing Co. beer which just recently became available in a can. The irony is that we were at the actual beach that's pictured on the can while drinking the beer! My dinner was steak and mashed potatoes. I must have been feeling dull that night because my choice was far from exciting and equally as satisfying. Medium well turned into well done and I skipped Duke's Famous (and free) salad bar, but filled up on dirty vodka martinis! Who's complaining? Not I. Here's Karen and I at Duke's! Her Mom and my Dad are siblings. Our Grandma Sally, who's 94 years old, has ten grandchildren and we're ALL GIRLS! Karen is first and I'm tenth. Terry rocking his Aloha shirt, me, and Karen modeling the foam flower! 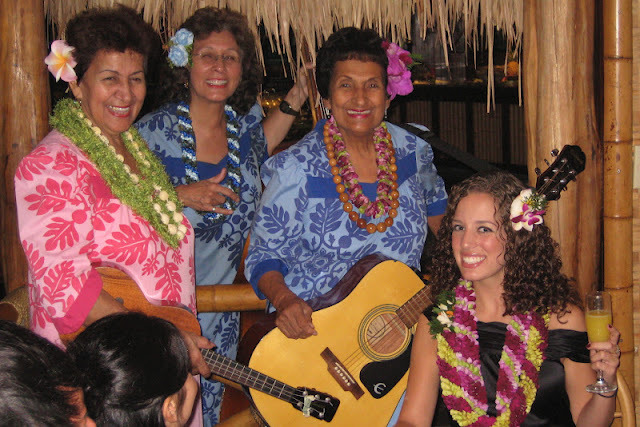 Duke's is the perfect place for such memories, filled with family and friends soaking up the weather, sweet ukulele tunes, and enjoying each others' company around the table. The food isn't the most exciting or memorable, although that doesn't seem to distract from the experience at all! The lobby is filled with Duke memorabilia, including a (smaller) replica of the life-sized statue that's just a few blocks away. The restaurant does a fantastic job of keeping Duke's memory alive and well, even for those who didn't know who he was prior to visiting Hawaii. Here's our group under the outrigger canoe in the restaurant's lobby: full and happy! Really, in a place filled with warm ocean breezes and surfboards, what's not to love? Wasn't he handsome? Obviously athletic, too. What you probably don't know is that he was a sheriff for Honolulu and was re-elected 13 times! Aloha Duke's, until we meet again!